the role emotional memories and patterns, and interactions of body, mind, social and physical environment for achieving long term results in optimizing performance and health. Erik generously shared his clinical wisdom with us, teaching many practical techniques for increasing self awareness, fostering control and self mastery skills, taking charge and actively participating in ones own healing process. The workshops were not only theoretical. 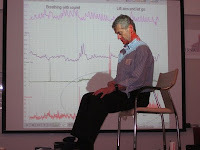 Erik gave us many impressive demonstrations using biofeedback on how to promote health." 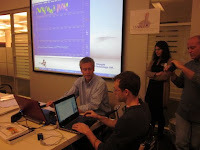 The workshop focused on integrating biofeedback with cognitive, somatic and imagery techniques. The biofeedback includes analysis of dysponetic muscle patterns, dysfunctional respiratory patterns in clients and training strategies to optimize performance and health. The biofeedback treatment strategies can be used in numerous disorders such as panic and anxiety, recurrent abdominal pain, asthma, muscle dysfunction, hypertension, autonomic disregulation disorders, PTSD and pain. Dr. Peper discussed the use of respiration biofeedback and other modalities (temp, SEMG, SCL, HRV) for stress management and for reducing pain, panic, anxiety and increasing performance. This course focused on teaching practitioners how to prevent computer-related disorders and presented a comprehensive approach covering workstation ergonomics, corporate culture work environment, individual work style, work/rest patterns and psychophysiological predisposition. 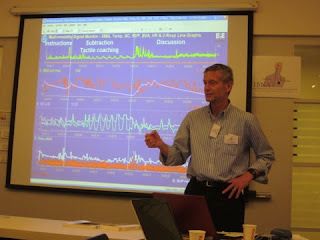 An emphasis is placed on utilizing surface EMG to take the guesswork out of assessment, monitoring, and training. “Dr. Pepers' contribution to the field of applied psychophysiology and Biofeedback over the past 40 years is huge. What I have learned from him as a student in many of his BFE workshops, has first of all, changed the way I cope with stress." "The ability to teach in a way that the participants not only learned new tools for their practice but also for the clinicians themselves, is one of the major strengths of Erik. He made everybody understand and feel hands on that clinicians need to experience Biofeedback themselves in order to be good clinicians." 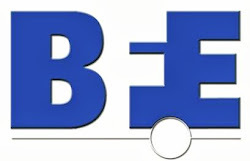 The BFE looks forward to working with the IBNA again in the future to promote biofeedback and neurofeedback in Israel.